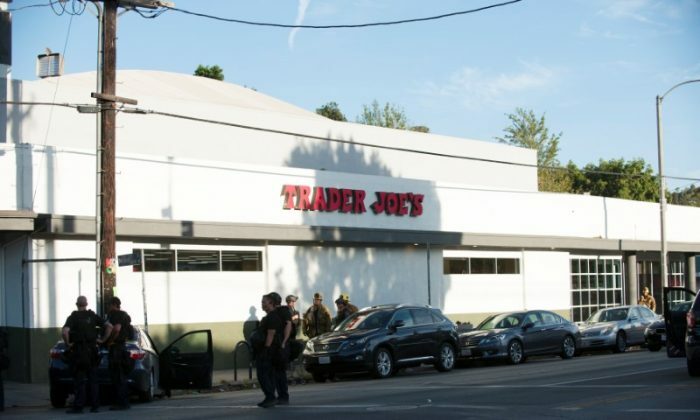 A 28-year-old man was arrested on suspicion of murder after shooting and killing a Trader Joe’s employee in Los Angeles. Gene Evin Atkins is being held on a $2 million bail, according to the Los Angeles County Sheriff’s Department, the Los Angeles Times reported on Sunday. Atkins was taken into custody at around 6:30 p.m. on Saturday, some two hours after he reportedly ran inside a Trader Joe’s in the Silver Lake neighborhood and allegedly held people hostage, according to the report. Hours before, police said that he shot his grandmother seven times and shot another woman. Then, he led police on a chase until he crashed into a light post near the Trader Joe’s. Atkins then allegedly exchanged fire with police before going into the store. In the incident, dozens of employees and shoppers were trapped inside. Atkins allowed some to leave, and other people sneaked out. Melyda Corado, 27, was identified by a man who said she was his sister. “I’m sad to say she didn’t make it. My baby sister. My world,” he wrote on Twitter. At around 6:30 p.m., Atkins agreed to surrender and handcuffed himself before walking out the door. He was taken into custody. Sean Gerace, an employee, was hailed as a hero for helping employees escape the standoff. “I grabbed an emergency ladder, barricaded the hallway, grabbed a weapon, put the ladder out the window, and just tried to get the attention of a SWAT officer,” Gerace recalled, according to Fox News. Atkins is being held on $2 million bail, officials said on Sunday.